ORACLE AEROSPACE PART OF ORACLE COMPONENTS LTD. ACKNOWLEDGES THE MOST IMPORTANT CONCERN OF ANY COMPANY MUST BE THE QUALITY OF IT'S PRODUCTS & SERVICES. Training and the services supplied. Procedures, service, communication & feedback. Our ongoing aim is to supply material and service levels that time after time exceeds each customer's requirements. We continuously review our compliance & effectiveness of the quality management system in meeting EN9120:2010 (technically equivalent to AS9120A) and ISO 9001:2008 and is assessed in accordance with EN 9104-001:2013. Oracle Aerospace ensures all purchased materials are of the highest integrity and are only from approved suppliers & manufacturers. Our QMS guarantees precise auditable material paper trails from manufacturers, suppliers and other MRO companies, right through to you the customer. All staff are trained to ensure we validate each order against the second specification while ensuring all manufacturing tolerances are met. Unexpected aircraft maintenance and repair problems are a contact threat to both large and small airlines around the world, a single Aircraft On Ground (AOG) incident could cost as much as $150,000 an hour to resolve. Small wonder then that airlines will go to extreme lengths to mitigate such circumstances - even to the extent of setting up AOG desks with rival carriers. 14-year' experience in the industry has given Oracle Components Ltd unique insight into the airlines' acute dependence on fast, reliable delivery of components that meet their specification, no matter how demanding or unusual. Critically this experience drives our resources, know-how, and determination to meet this need whenever and wherever it arises. Now, this resource has been distilled into our Aero division Oracle Aerospace - a brand new, highly-focused MRO part specialist for commercial airlines backed by all the expertise, staff, systems, contact, stock, financial strength and support of the well-established Oracle Components Holding Group. 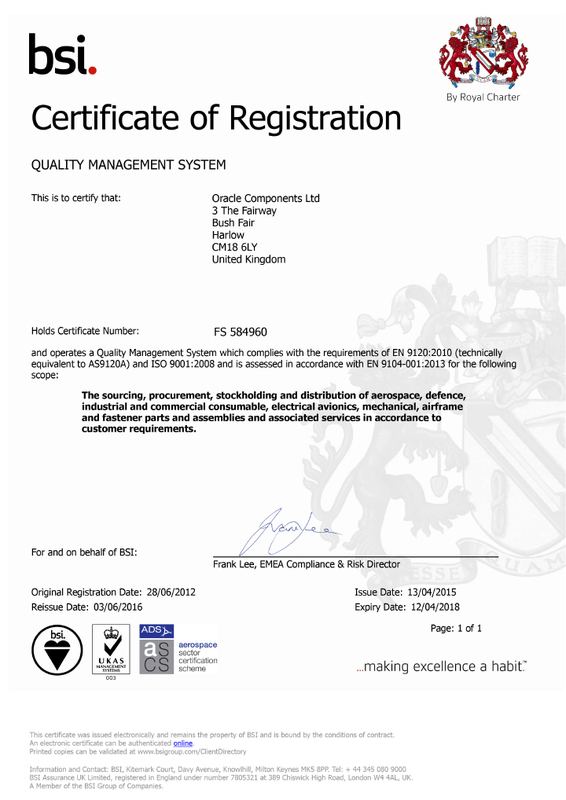 Don't just take our word for the quality and efficiency of our organisation, though, BSI has just renewed our AS9120A certificate, confirming their satisfaction that we operate a Quality Management System which complies with the requirements of EN 9120:2010 and ISO 9001:2008. According to Government figures, the UK aerospace industry has a 17% share of the global market by revenue, making it the largest in Europe and second only to the US worldwide. We serve organisations of all sizes within this cluster, acting as a closely-integrated extension of their purchasing resource. Our customers see a single, efficient and responsive point of contact, behind this lies our diligent team, SkyNET IT system, 15 parts systems and over 5000 accounts with approved suppliers giving us real-time access to any parts needed.